Reporting back after my trip (too late for BrewArk — sorry). I agree with the comments on the Frog Pubs. I never made it to La Fine Mousse, unfortunately. I still recommend La Cave à Bulles. But overall, in my estimation, the beer scene hasn’t changed much since I was there four years ago. Belgiany beers are available from most cafés, brasseries, etc., usually of a Belgian Wit or Pale bent. But you’re better off having the outstanding and inexpensive wine. The standard Fischer and Kronenbourg beers you can get in most places are to be avoided, in my opinion, unless you’re parched and need a refreshing quaff from all the walking. They’ll slake your thirst but, on contemplation, are pretty bland. I did have a Fischer Réserve Ambrée in Strasbourg (earlier in the trip). It was like a Belgian Pale, with some pleasant toasty and biscuity malt notes, but it finished very sweet (hard to finish the half liter pictured on the right below). That might work. I use one of these. Bryan, I'm pretty sure I've asked, but that is even with purging the bottles thoroughly first, right? Yup.. "Purging" doesn't really work when its not under vacuum. Its more like "gas mixing", and the higher the pressure the more the mixing.. I forget the exact amount but even when purging a keg like 25x will still leave you with .4ppm or so. Agreed! Gases don't behave like "blankets". Well, maybe in certain situations they do for a short period of time, but definitely not in this case. Bryan, do you plan to post a parts list (sorry if you did and I missed it)? I've heard rumors of some guys who've been able to malt their own grain here but the more knowledgeable folks I've met here think there's something sprayed on the barley or some kinda kilning process to stop the barley from malting. That's a crime against nature right there. I'm considering this. Think it would work with a siphon instead of a dip tube and bulkhead? The first glance made think it was an air filter from a carbureted car back when. Maybe a vendor had excess tooling to make these? If one uses an immersion chiller, wouldn't it get in the way of that? Whirlpool should be performed after chilling and removal of the immersion chiller. A lot of homebrewers perform a whirlpool as part of their chilling process, to speed it up. Even if they didn't, it would seem cumbersome to remove the chiller and drop that filter down into the wort without disturbing the break cone. I don't understand how it works. Whirlpools push the break out to the sides where gravity pulls them down and to the center. If that things gasket is on the bottom, how is break getting in the middle? It would have to be added after the whirlpool, but that would be difficult, at least for clumsy brewers like me. Will you please post a parts list for your set-up? I also brew Denny-style but want to adapt it for LODO. Sure, here is an Amazon wish list containing all the fittings. Some are no longer available, but at least you can see the specs. The foam board and foil tape are just what you can find at any hardware store. This thread got away from me. Someone was talking about DIY mash caps a few pages back. 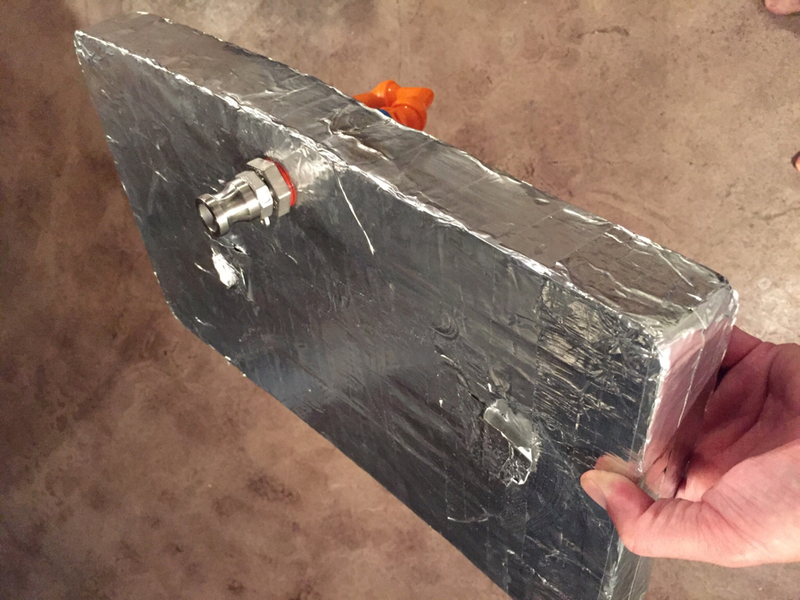 Long before I knew about lodo, I made one for my Denny-style mash tun with some foamboard and foil tape. 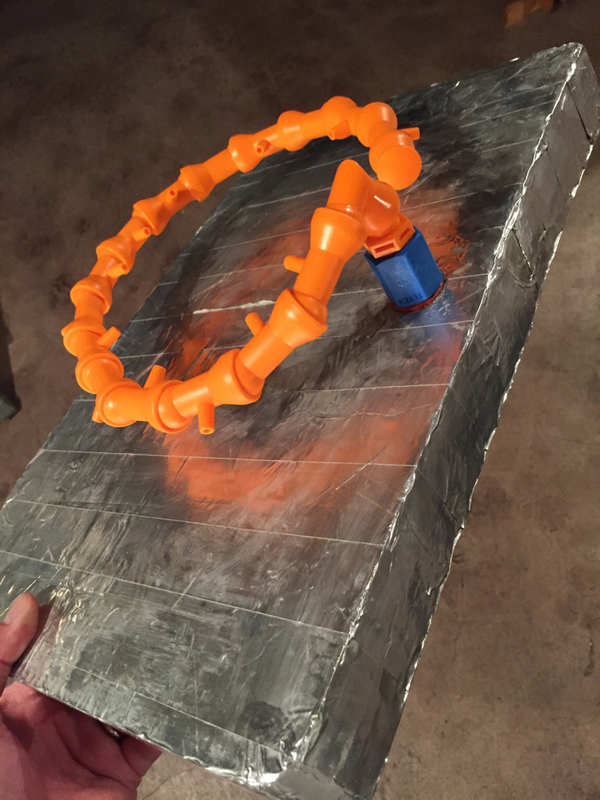 I recently added a circle flow kit for recirculation. You can certainly build something much nicer than this (and many have), but I'm posting it to show how low the bar can be. When I was in Paris in 2013, you could get some interesting French and Belgian beers in some of the cafés and brasseries, but there really wasn't much of a craft beer scene at all. I did go to one good bottle shop called La Cave à Bulles (in the 4e, I think). If things have improved, and I suspect they have, I look forward to hearing about it from other commenters. I'm returning this summer! Shandies are generally not brewed, Leinenkugel notwithstanding. Shandies are usually mixed in a serving glass by adding beer to lemonade. I've not brewed with huckelberries before. If they are like blueberries you will need at least 1 lb/gallon for a huckelberry beer. And traditionally, it's a soda like 7 Up. It's referred to as lemonade in other countries. I don't think what they call lemonade is as sweet as 7-Up, do you? I force-carbonate lemonade and use that. It makes a pretty good match for the Radlers I've had in Munich. This might help with your efficiency adjustment, in case you haven't seen it. Underletting is a good alternative that helps avoid clumping. I've used Vienna as a base malt for British beers, and it has worked really well. It may seem inauthentic, but the nutty, toasty flavors it provides are exactly what I expect in those styles. Equipment and Software / Brewing Software - Recommendations? I'm one of the people you emailed it to, so thanks for that! I used applications (both desktop- and web-based) for ages, but 3 batches ago I switched to my own spreadsheet. I use Numbers and sync to all my devices using iCloud, but I'll likely find some tidbits in yours to steal. Although mine is still a work in progress, I agree with all the sentiment here. I like being fully aware of what formulae I'm using, being able to tweak every constant easily, and most of all, being able to add calculations as needed. For example, the other day I needed to know the mass of the cast-out wort. Adding that to the spreadsheet was trivial, and now it's there for future batches should I ever need it. Okay, I tasted this again today, one week into lagering. The green apple is gone--thankfully--but there is a little sweet flavor that I would describe as candy or sugar. Remember those little straw candies they used to sell? They were paper straws filled with sugar. That's sort of what I'm getting from it.